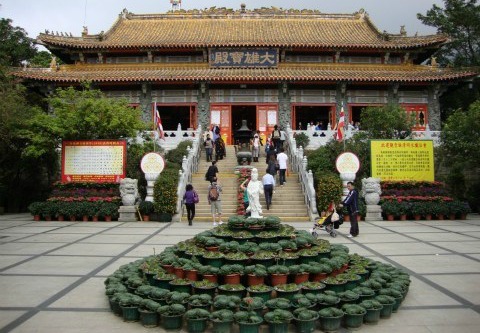 The Po Lin Monastery is a very famous Buddhist temple found on Lantau Island. It has become a very important temple and popular tourist attraction in Hong Kong. 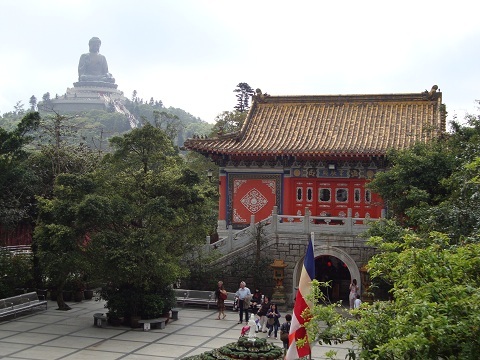 The Monastery is found in a flat area of land of Ngong Ping, surrounded by mountains. This makes for a very secluded, relaxing and scenic atmosphere. This is the main reason the monastery was built all the way out here. Make sure to bring a camera with you since this place has wonderful views. The biggest attraction at the Po Lin Monastery is the giant Tian Tan Buddha statue that sits on top of a nearby mountain. This statue was built in 1993 and has made the Monastery a very popular tourist attraction. 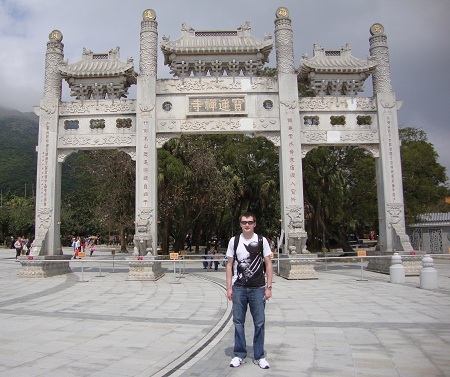 When you arrive at the Monastery you’ll be welcomed by a traditional Chinese architectural white gate. From here you can continue on to the temple. Around the temple you’ll find all sorts of statues, plants, decorations and burning incense. The main attraction inside the temple is the 3 large golden Buddha statues. The roof is decorated very elaborately and the pillars on the temple have been crafted to look like dragons. If you face away from the temple you can see the Tian Tan Buddha. Keep an eye out for some monks dressed in robes around the Monastery. You can enjoy a vegetarian meal at the vegetarian restaurant on site. They even have imitation meat products for those who can’t live without the taste of a certain kind of meat. Tickets for the vegetarian meal can be purchased at the entrance to the Tian Tan Buddha statue. This ticket will also get you into the museum at the top of the Tian Tan Buddha. You should also be aware that no meat or alcohol is allowed on the premises. If you want to eat some meat or have an alcoholic drink, you should go to the nearby Ngong Ping Village and do so there. 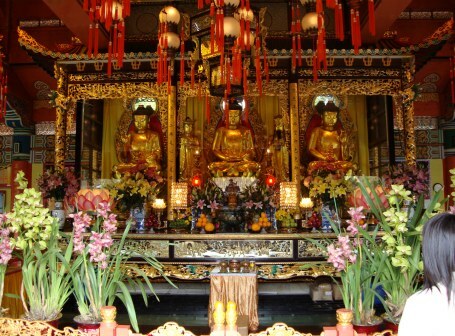 The busiest times of the year at the Po Lin Monastery are Buddha’s Birthday (usually occurs between end of April-end of May), and Chinese New Year (between end of January to mid-February). I would advise planning your trip around these days unless you like large, lively crowds. There are a few bus routes that can take you out to the Monastery. The closest MTR Station is the Tung Chung MTR Station. From the Tung Chung Station you can ride on a Ngong Ping 360 cable cart to Ngong Ping Village. From Ngong Ping Village it’s just a short 5-10 minute walk to the Monastery. Ngong Ping Village and the Ngong Ping 360 are both within walking distance. Ngong Ping 360 is a very popular and unique cable cart ride that takes you to Ngong Ping Village. From Ngong Ping Village it’s only a 5 to 10 minute walk to get to the Monastery. Nearby attractions include Hong Kong Disneyland, Ngong Ping 360 and Tian Tan Buddha. Nearby shopping includes the Citygate Outlets and the Hong Kong International Airport. The Hong Kong International Airport is located very close to the Po Lin Monastery. If you have a long layover in the airport, you could make a day trip out here and easily make it back to the airport in time for your connecting flight. The Po Lin Monastery is one of the most popular Buddhist temples in Hong Kong. It’s worth visiting for the great mountain views, stunning architecture and the Tian Tan Buddha. You can make your trip to the Monastery more memorable by riding the Ngong Ping 360. It’s also close to the airport and makes for a perfect day trip.